More than 100 golfers scrambled around Southern Hills Golf Course, including recent Masters golfer Sammy Schmitz, during the 2016 Louis Schmitz Golf Classic June 17. 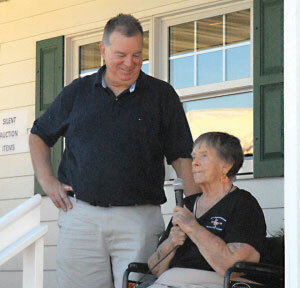 Louis Schmitz’s son Randy and Louis’ wife Jean thanked the crowd for their efforts in keeping Louis’ legacy alive. The scramble honors Louis Schmitz, a longtime youth sports supporter and coach who died in 2011 at the age of 85. One of Schmitz’s passions was to help young people play sports who may not be able to afford it otherwise. The foundation provided financial assistance to the Farmington programs in youth football ($2,400), youth softball ($1,000), youth hockey ($3,100), Farmington High School girls hockey ($1,000), Farmington Community Education ($1,000), Farmington High School boys hockey ($350), Farmington High School wrestling ($350), and two scholarships to Nicole Willis and Christian Groves ($2,000 each).